I'm way behind on my holiday cookie schedule. Starting the day after Thanksgiving, my life at this time of year is no longer my own. A number of years ago I started baking cookies and giving them as gifts at holiday time. Since that time, come December, the cookies and their demanding schedule rule all, and I am but their servant. However, this year life has intervened in some pleasant ways, as well as other, well, never-mindish, not-so-pleasant interruptions for which I will not provide any links -- but which, it will suffice to say, don't do a lot to get me in the holiday spirit. Especially when I'm berating myself for not having enough cookies made. Usually by the second weekend in December I've got quite a stash on hand. Woe is me, I have but four sorts baked at the moment. I don't freeze cookies for the holidays, since I a) don't have much freezer space, certainly not enough for 1500 cookies, and b) think that some varieties do tend to deteriorate in the freezing. For years now, I've used my venerable but falling-apart copy of Rose's Christmas Cookies as a guide to how well certain kinds of cookies will keep if stored in airtight tins. In every recipe, Rose Levy Beranbaum thoughtfully includes tips for storage and an idea of how long the cookies keep at room temperature. And she's much more generous in this regard than most recipes I read, which usually tell you that your cookies are best eaten within a few days. Rose believes that many cookies keep very well at room temperature for quite a while, even some of the more butter-rich types. And truthfully, she's never steered me wrong on this count. I use her good sense about this as a guideline, even when I'm not making her exact recipes (which are all excellent, btw). For example, I may make my own recipe for pecan sand tarts, but I look up Rose's storage tips for her Mexican Wedding Cakes or Three-Nut Fingers, since the ingredients and proportions are similar. That's how I create my own time-template for cookie making. I generally make the "good keepers" early, and save the more fragile ones for right before giving/eating time. I've just finished making the lumpy bumpy oatmeal cookies. I've got wallflower loaves ready to be sliced and so reveal their mosaic loveliness, and there are linzer biscotti "curing" in their tin on the kitchen counter, since they are one of several types whose flavor deepens with time. I haven't yet gotten to dulce-de-leche bars, hazelnut lebkuchen, peanut-butter blossoms or cups, pecan sand tarts, orange-almond florentines, espresso eclipse (coffee shortbread dipped in dark chocolate), midnight mint (triple chocolate mint cookies), perhaps some lovely lemon sablées like Molly, probably a batch of Korova cookies, maybe my favorite chocolate-dipped meltaways. We'll just have to see what the next couple of weeks bring, both in terms of cookies and time-management crises. But the one other type I've managed so far are the ginger cookies. Not just your ordinary, everyday ginger cookies, either. My recipe has gone through some evolution over the years. I've tweaked and bumped up the ginger to a level to where they're almost hot; crisp and crunchy with a rich spice bouquet and a lovely candied ginger bite. This year I also gussied them up with some big glittery sugar; now they don't have to feel like Plain Janes on the party plate next to some of the dressier sweets. And they too are good keepers -- honestly, like most gingerbread, they last for ages. It's actually a shame to eat them too soon, since the gingery kick develops over time. And what's more, they're good for you. It's not that they don't have plenty of butter and sugar and all of those not-so-good-for-you things, because of course they do. But they've got ginger as well. Long known as a folk remedy for whatever ails you, I'm here to tell you that ginger really does work. The other night my stomach was somewhat upset after dinner. I remembered the counsel of my former supervisor, a dear Jamaican woman who I'm blessed to consider friend, mentor and colleague. She has long sworn by ginger as a panacea, particularly for stomach woes. 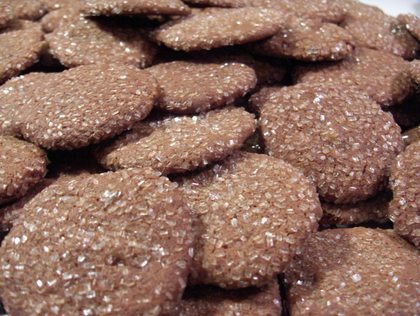 With her in mind, I ate one of these sparkly beauties, and low and behold, my stomach settled right down. And just the other day I was sitting through the longest class in the world with a friend/colleague who's pregnant -- with twins -- and having a very rough first trimester. One of these crunchy sparklers worked so well to settle her all-day, all-night morning sickness that she begged me to bring in some more for her the next day. Have a cookie for your upset tummy, why don'tcha. These gingery mouthfuls are sturdy, easy to assemble, keep well, and win raves from ginger lovers, molasses fans or your general spice enthusiasts. So go forth with a bold footstep -- no need to tread gingerly with these. I find these cookies deeply reminiscent of people, places and times. I think of the ginger lovers who ask for them each year, an estranged friend who used to particularly adore them, holiday parties gone by and family friends who made similar cookies when I was a child. But most of all, I think of my own mother, who was an ardent ginger fan. We used to buy her jars of preserved ginger in syrup, ginger marmalade, ginger ice-cream, stem ginger biscuits, chewy ginger candies, crystallized and chocolate-dipped ginger. She was fond of the root in all its guises -- and she loved these cookies, too. Combine the butter and 1 cup of the sugar in the bowl of an electric mixer. Beat until light and fluffy, 3 to 5 minutes. Beat in the egg, molasses, grated lemon zest and grated ginger. Sift the flour, soda, cinnamon, cloves, nutmeg, allspice, ginger, and salt together onto a piece of parchment. Add to the butter mixture in 2 batches, beating just until combined. Stir in the crystallized ginger. Cover with plastic wrap and chill for 2 to 3 hours. Preheat the oven to 350 degrees F. Place the coating sugar in a pie plate. Shape the dough into one-inch or walnut-size balls and roll the top half in sugar to coat. Arrange 2 inches apart on greased baking sheets and bake until cracked and dry but still soft, about 10 minutes. Cool on the baking sheets for 5 minutes, then transfer to cool on wire racks. Makes about 5 or 6 dozen. Can't wait...I will think of Mom with every bite of those beautiful snaps. the amount of cookies mentioned in this post is scary. i have to stop reading and get myself something to curb this new cookie appetite. Hey bro-- I'm baking you up a big batch, with special attention to all your favorites -- as usual. Yvo and Vanessa -- it's probably too late for this year, but it suddenly occurred to me that next year we should do an NYC food bloggers cookie exchange -- live instead of all the virtual ones! Whaddya think? P.S. Thanks for the tip on Rose Levy Beranbaum's Christmas cookie book! I hadn't heard of it, but now I'll add it to my list. Her storage tips sound like a dream come true. I have never had trouble freezing cookies - thawed some of the chocolate rads and lemon sables on Saturday for a dinner with friends, and they were wonderful - but certainly some cookies might fare better than others. As a home baker, I owe a great deal to Rose Levy Beranbaum -- she has always been so careful, methodical and informative in her recipes, talking about the science behind each baking interaction long before "kitchen scientists" were in vogue. I know when she says that a particular cookie will last 3 weeks at room temp or 2 months in the freezer, it's because she's tested it out, over and over. Hey! All your readers should know that your extreme gingersnaps were featured on that foodandwine.com website! Check it out. I've tried the Ginger cookies and they are amazing (as is everything Julie seems to make). I'm trying to make them for a cookie swap. We'll see whether I can pull this off??? After reading, it seems like I have many more cookies to try. I need to start baking. I do enjoy ginger in my cookies. Yet another recipe to add to the "must bake with children" list. what a gorgeous website! Lovely writing. I've just read the essay on "lumpy, bumpy oatmeal cookies" and tried the ginger cookie recipe on this page. So far I have eaten two right out of the oven--naughty, I know, as I'm supposed to wait for the ginger to bloom. And bloom it will, I think! Rachel, I'm so glad you're enjoying A Finger in Every Pie as well as the Extreme Ginger Cookies! Thanks for stopping by. Fantastic! I have been searching for a super-ginger recipe and I found this on Google. I am eager to try. Hopefully this will become one of my Christmas cookie traditions! DB, this cookie has its own set of disciples, people love it so much -- especially my husband. Let me know how you like it. excellent! I have made the first batch and love them. Yum. I love these ginger cookies !! Beautiful cookies, Julie! I love the sound of them! I love ginger too. I used ginger on most of every food that I eat, when I was preagnant due to nausea. There are lots of benefits from it. And it also calms the upset stomach!.. Now I should try this ginger cookie, thanks for the recipe!